Gabon is on the equatorial coast of West Africa (Figure 1) between the Congo and Niger deltas, surrounded by Equatorial Guinea and Cameroon to the north and Congo to the south and east. 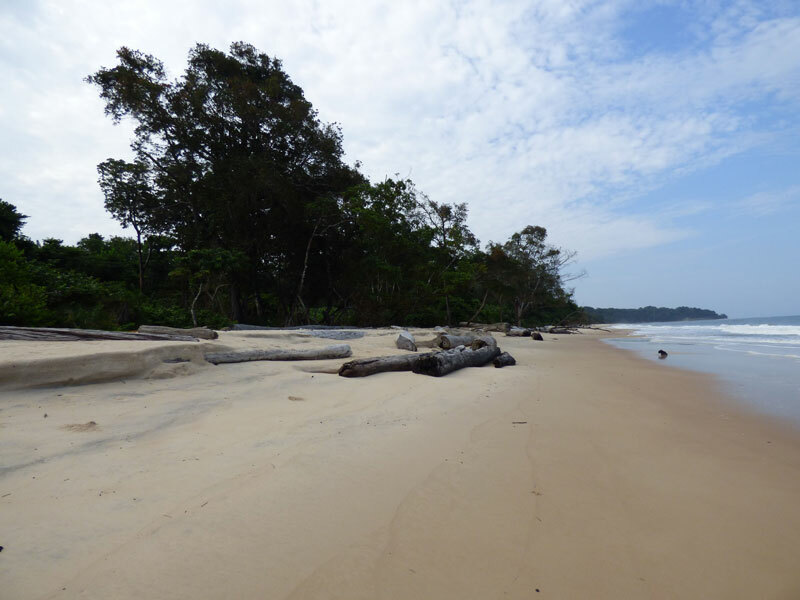 Gabon has a long, sandy coast backed in most cases by a dense tropical rainforest. The density of the forest makes the beach a handy thoroughfare for the large animals that dwell in the forest. 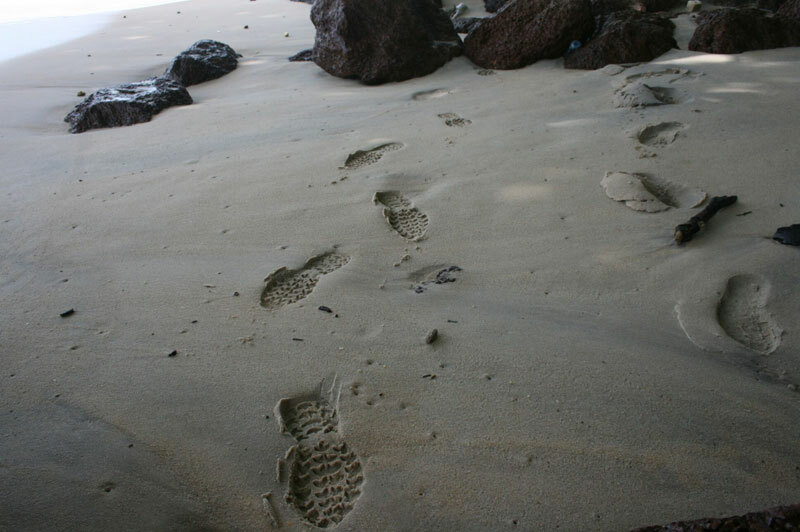 Footprints and other traces (e.g., elephant dung) of wild animals can frequently be seen on the beach. Elephants, buffalos, various antelopes, monkeys, pythons and even leopards leave their trails on the beach. Seeing the animals themselves is, however, less common as they probably travel by night, the time when being on the beach could be dangerous to people. 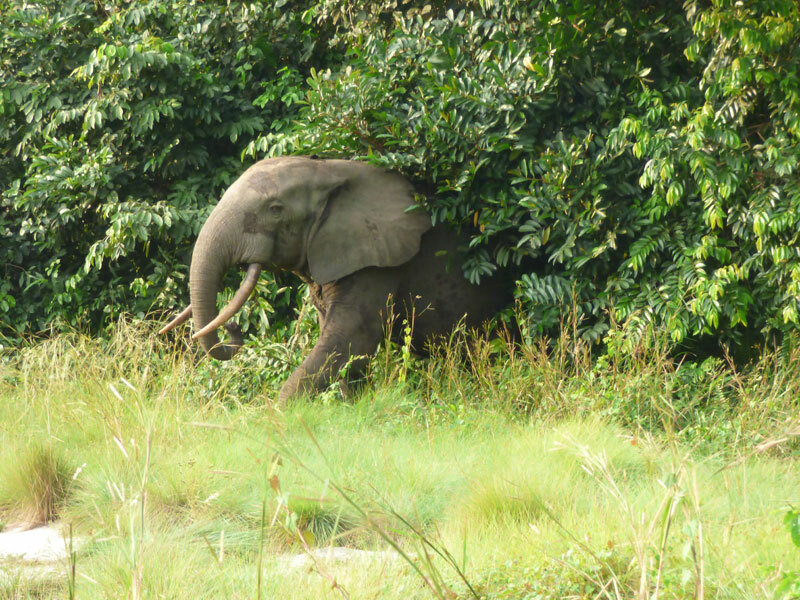 Elephants, the largest of the animals at the Pongara shoreline, are a separate species, distinguishable from elephants in interior Africa by their slightly smaller size and different tusk pattern. 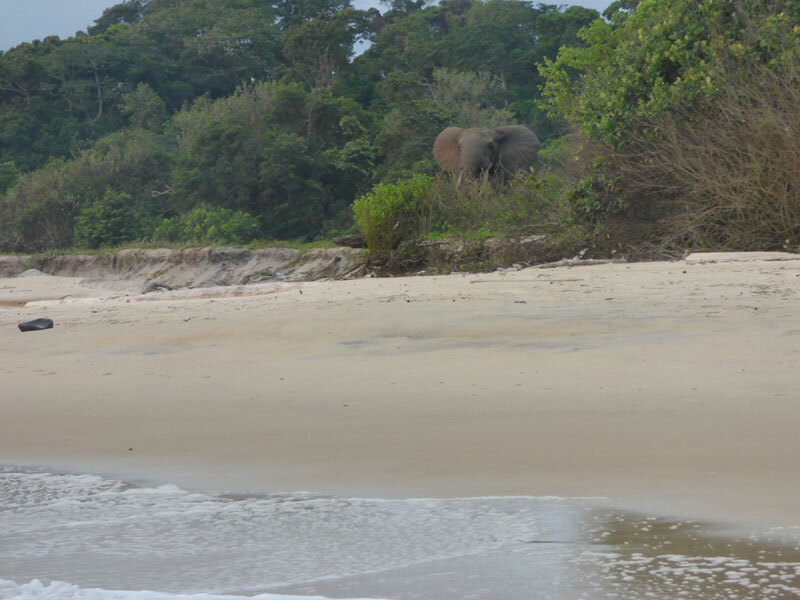 These forest elephants come to the beach in the early mornings and at dusk. (Figure 2) Perhaps this is done to consume some favored plant in the zone of salt spray. Trampled small trees next to the beach provide evidence of their eating habits (Figure 3). Hippos are rare here but they are known to frolic in the salt water, an activity avoided by elephants. 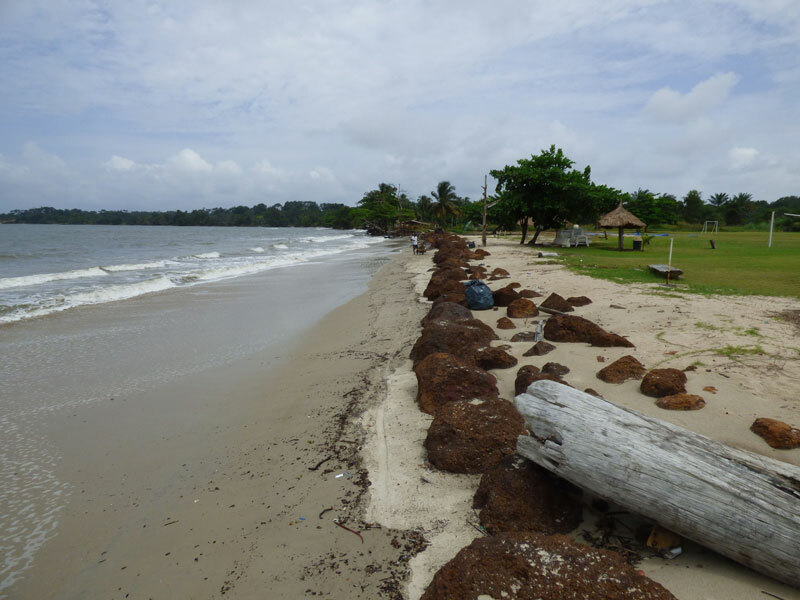 This Beach of the Month report emphasizes the beaches at the Pongara Beach resort in the Pongara National Park located across the Gabon Estuary just south of the capital city, Libreville. Gabon is not on most international tourist maps. 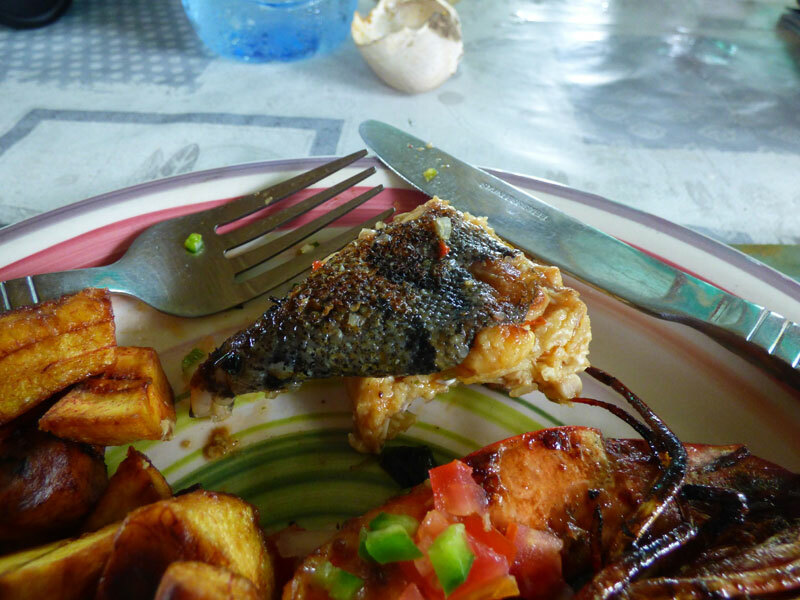 Most of the visitors to the resort at Pongara are Gabonese. 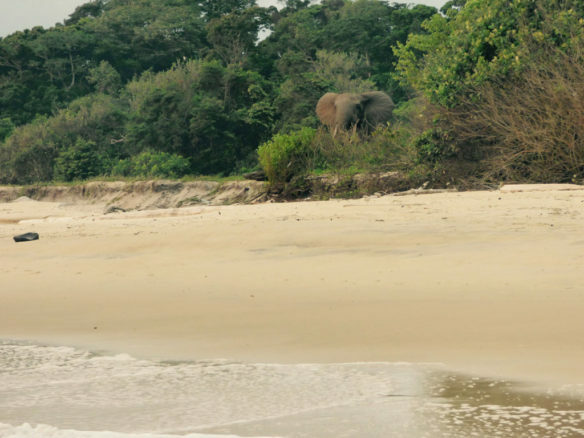 The wild animals, beautiful beaches, and closeness to nature (Figure 4) are, however, good reasons to visit beaches in Gabon’s national parks. 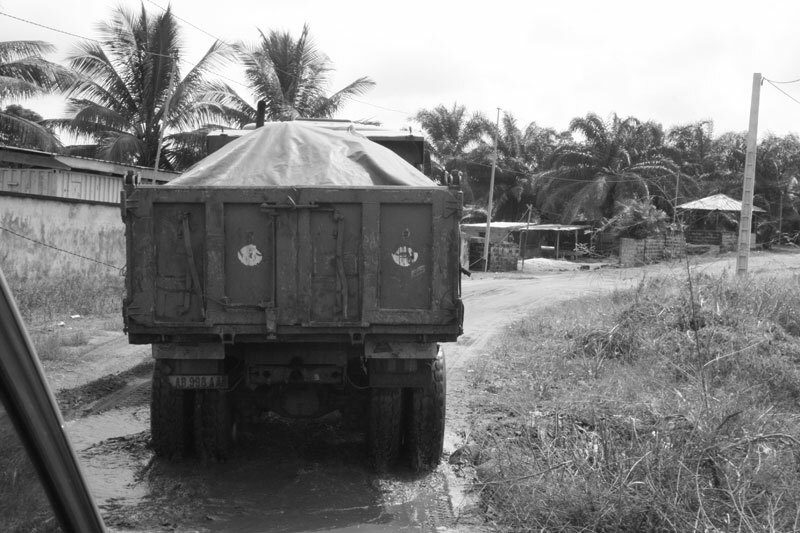 One problem facing beach tourism in Gabon, however, is the very poor quality of the roads leading to many beaches (Figure 5). 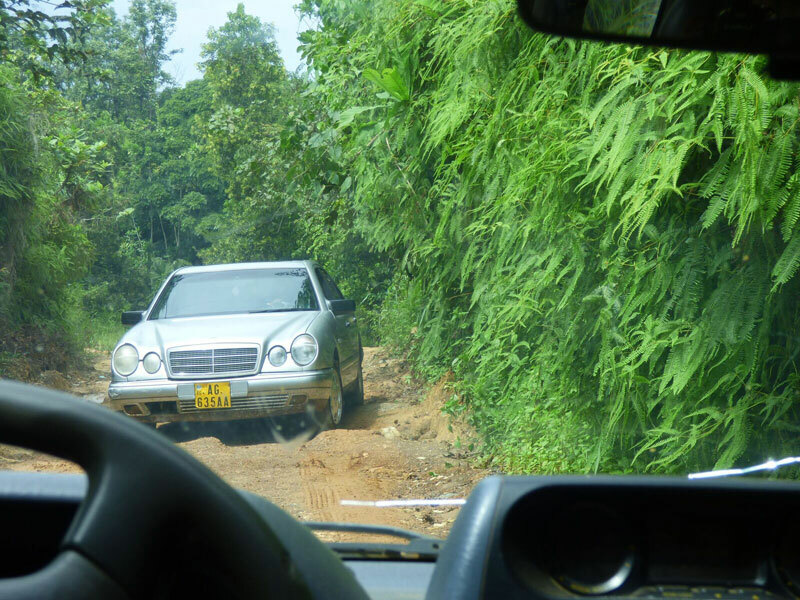 Getting to the Pongara Lodge is an adventure in itself. 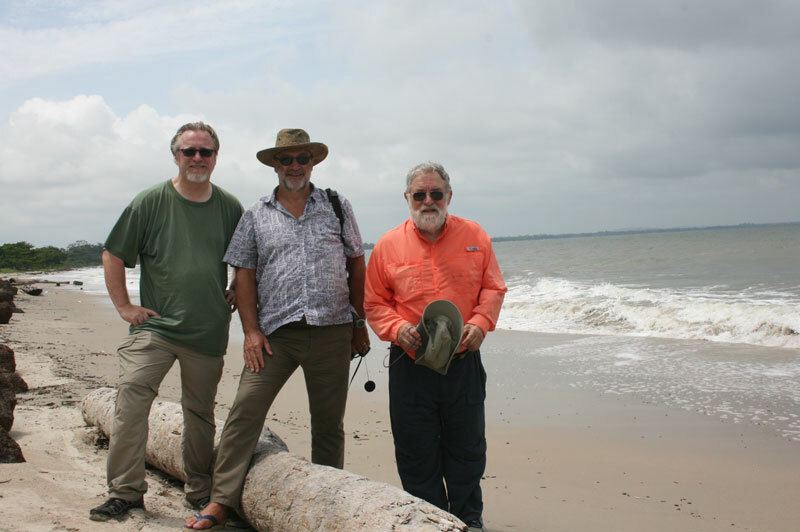 A 45- minute boat ride across the Gabon Estuary and into the open Atlantic Ocean terminates offshore of the lodge where there is no pier or dock. Visitors and their luggage are transferred carefully and in small numbers onto a tiny boat with wheels that runs ashore and is pushed up the beach by 4 men waiting hip-deep in the surf zone. The process, requiring skillful timing to cross the surf zone, ensures that visitors arrive without as much as a splash of water. The light yellow-brown sandy beach runs for many kilometres, interspersed with occasional headlands of well-lithified Cretaceous rocks that form low cliffs. Grain size of the intertidal beach is well-sorted, medium sand with strikingly small amounts of shell material larger than sand size. Shell lags are rare and consist of small shells only. Concentrations of heavy minerals (black sand) are common. The heavies are responsible for a number of colorful beach surface features including rings (Figure 6). Wave energy is low and often the waves don’t even break before they reach the shore. Instead they swash up the beach which has a very steep upper profile. At low tide, a flat sandy terrace is often present. There is little evidence of big storms and significant storm surges impacting on the beach. The lack of storm deposits is characteristic of shorelines near the equator. Backing the beach is usually a small sandy ridge with relief of less than 5 feet and no evidence of extensive overwash penetration into the rain forest. The major exception to this is the incursion of sand (and logs) at small river mouths. Soft (bubbly) sand is (Figure 7) ubiquitous on the uppermost beach, making walking difficult at high tide. Walking is further complicated by accumulations of logs on the beach, which require stepping over or around. The soft sand is due to cavities formed in the sand by air pushed up by a rising tide. Equally ubiquitous is barking sand which is often found when the sand is well-sorted and without shells. Dog Island, Florida, beaches also exhibit widespread barking and, like the beaches of Pongara Park, are fine-to-medium well-sorted sand with little calcareous material. 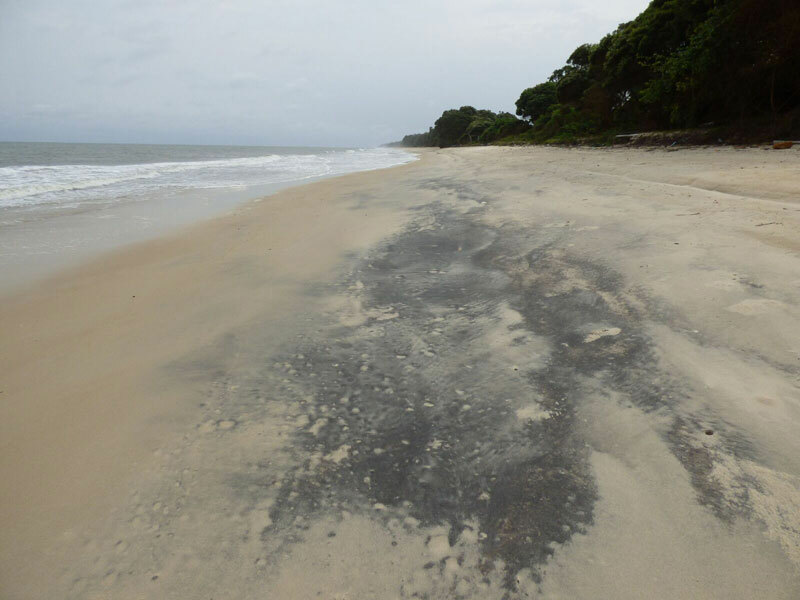 The source of sand on Gabon’s beaches is likely sand deposited on the continental shelf during lower sea levels. It is clean and well-sorted, unlike fluvial sands, but it is likely that the sand supply from rivers to northern Gabon beaches is high. One indication of this is the paucity of sea shells on the beaches, possibly indicating that the shell content is being diluted by terrigenous sediments being contributed to the beaches at the present time. 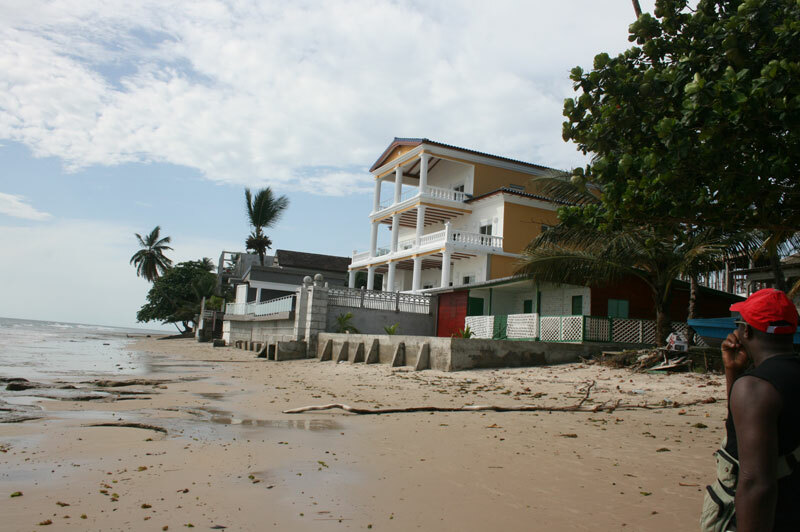 Everywhere in northern Gabon the coastline is eroding (Figure 8). 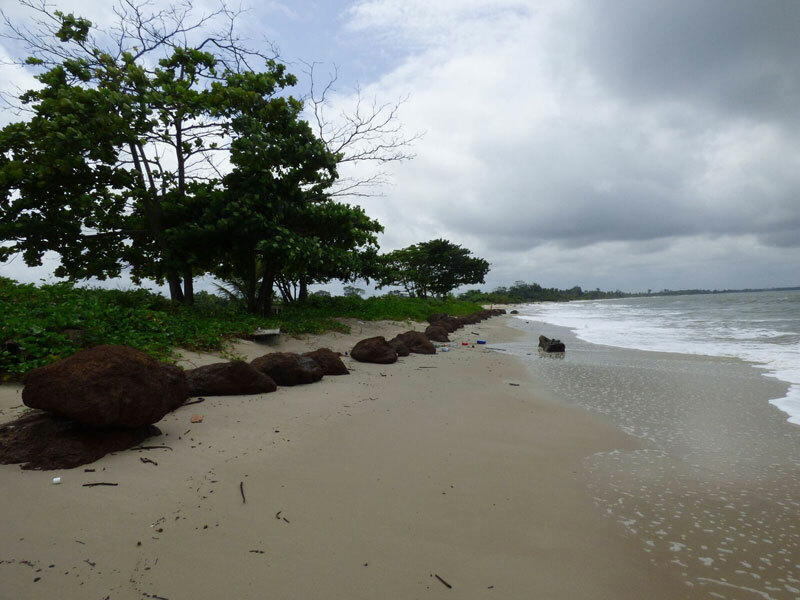 Trees falling into the surf are clear evidence of long-term erosion, and along the Pangora ocean shoreline this is in the absence of engineering shoreline stabilization structures such as groins or seawalls that cause erosion elsewhere in Gabon. 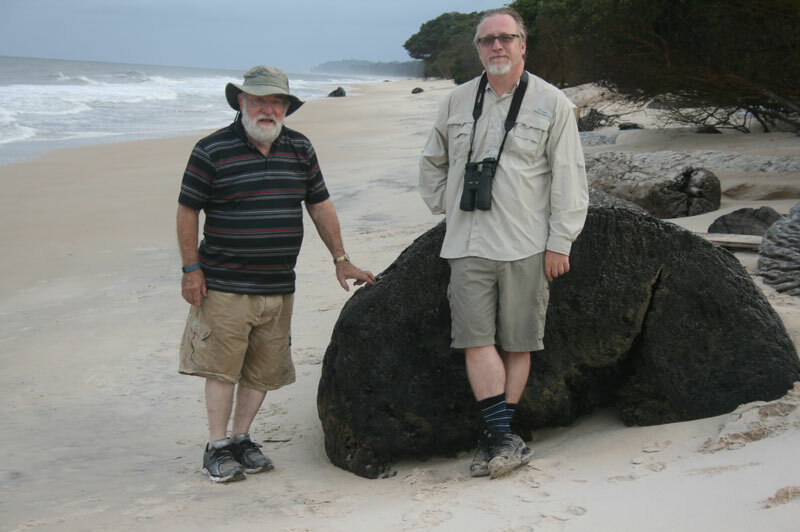 A feature everywhere on Gabon’s beaches is the abundance of huge logs exhibiting flat-sawed ends (Figure 9). Broken free from rafts as they are floated downstream from the interior forests, thousands of these by-products of the country’s logging industry form an important part of almost every beach, including those of Pongara National Park. (Figure 10) They are usually washed up and deposited near the uppermost beach, but they frequently are covered and uncovered by sand and occasionally repositioned. Interestingly, we saw no floating logs off any of the beaches we visited. 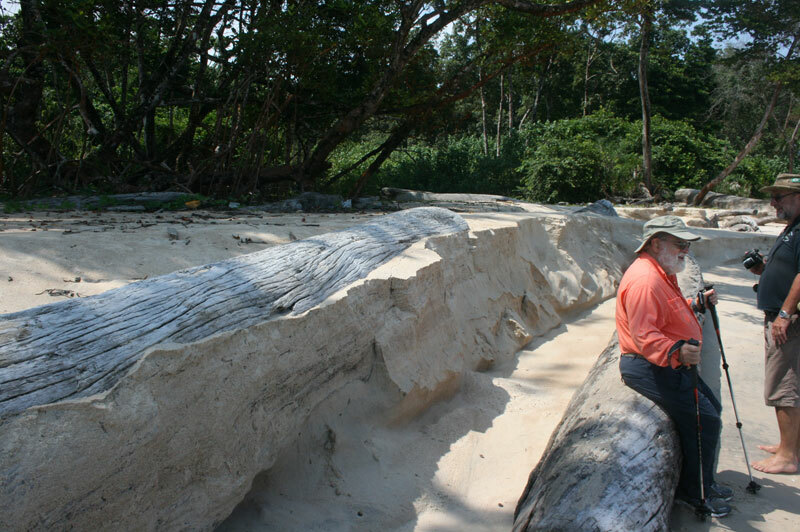 Over a three-day period at Pongara Lodge, a 6-ft-long woody stump protruding from the sand on the bathing beach was revealed to be a 50-ft log, as the beach level lowered. The highly dynamic nature of the beaches is somewhat at odds with the lack of storm evidence, but the waves approach consistently from the southwest at quite an angle to the shoreline, so longshore drift is active on the steep beachface. The logs act as impromptu and flexible seawalls, but they shift landwards as the coast retreats. Virtually the entire shoreline here is eroding at what appears to be a slow rate. Unfortunately plastic is another ever-present component of the uppermost beach here. In the park, the plastic is mostly made up of drinking water containers. Plastic debris is unevenly distributed (Figures 11a, 11b) but as a rule, although it is widespread, only small amounts are present. This is in stark contrast to beaches near Libreville which are covered in domestic waste. 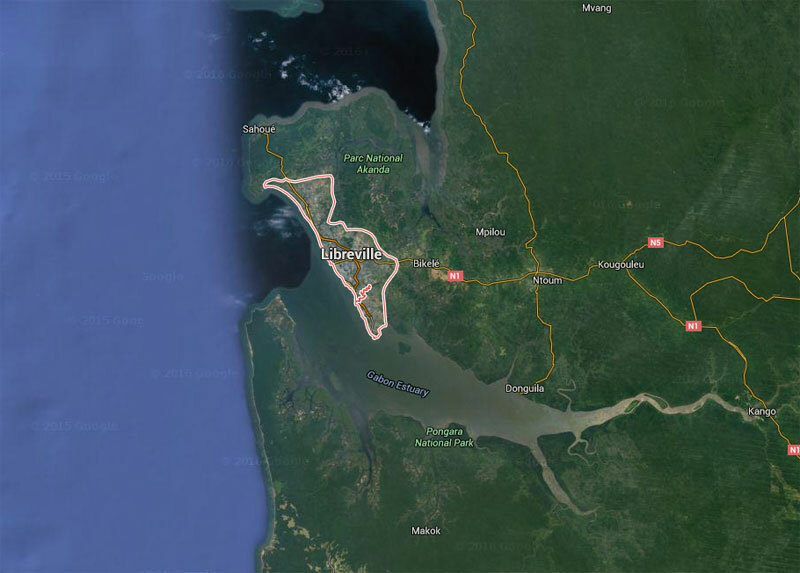 The Libreville shoreline on the north side of the Gabon Estuary is a different story. 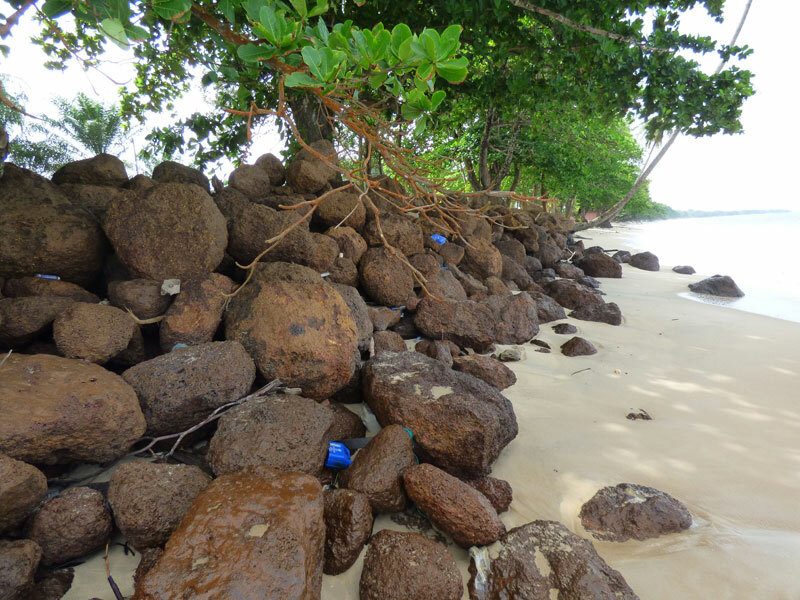 Wherever there is property near the beach (Figure 12), one finds makeshift seawalls made of laterite boulders (Figure 13). Laterite is a rusty red rock, found in warm tropical climates. It is formed by the gradual long-term weathering of the underlying soil and rock. The lines of red boulders are found on almost every beach we visited that had some sort of development adjacent to it (Figure 14). As a result, at high tide most beaches are narrow or absent altogether. Many of the walls are used to stabilize the shoreline in front of a single structure (Figure 15) such as a small store or restaurant, thus creating erosion problems on adjacent shorelines. 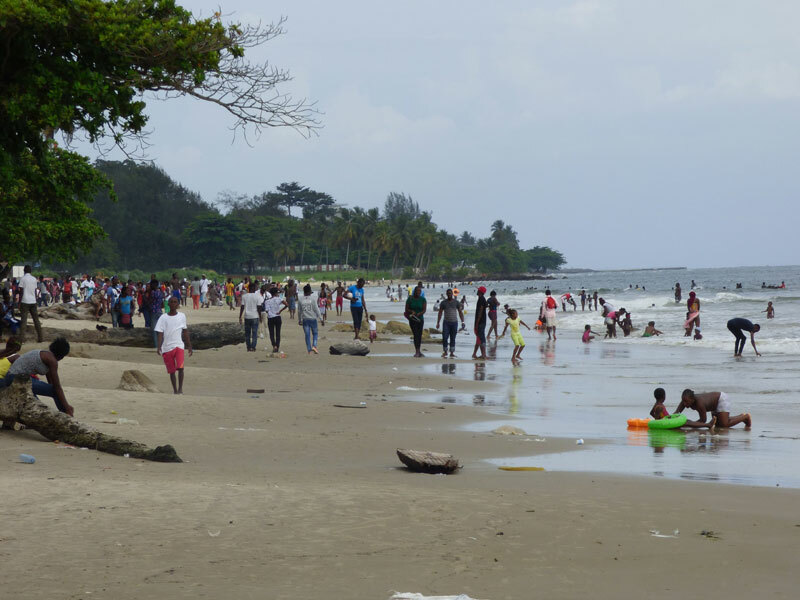 Virtually the only swimming beach in Gabon used by large numbers of people is in Libreville (Figure 17). We were informed that swimming and beach strolling by local people has only been important in the last decade or two. Outside of Libreville we saw only occasional swimmers on the beach, usually children. 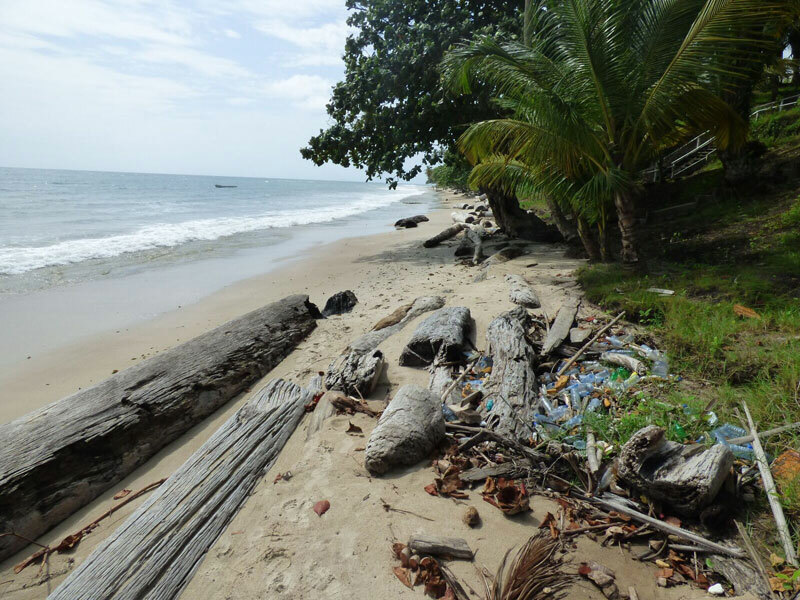 In contrast to the beaches in Pongara National Park, the beaches on the north side of the Gabon Estuary and on the adjacent open-ocean beaches are strewn heavily with plastic. In front of remote restaurants/bars, the beaches appear to be regularly raked and the plastic gathered in piles. It seems that the piles must wait a long while before being removed (if ever). 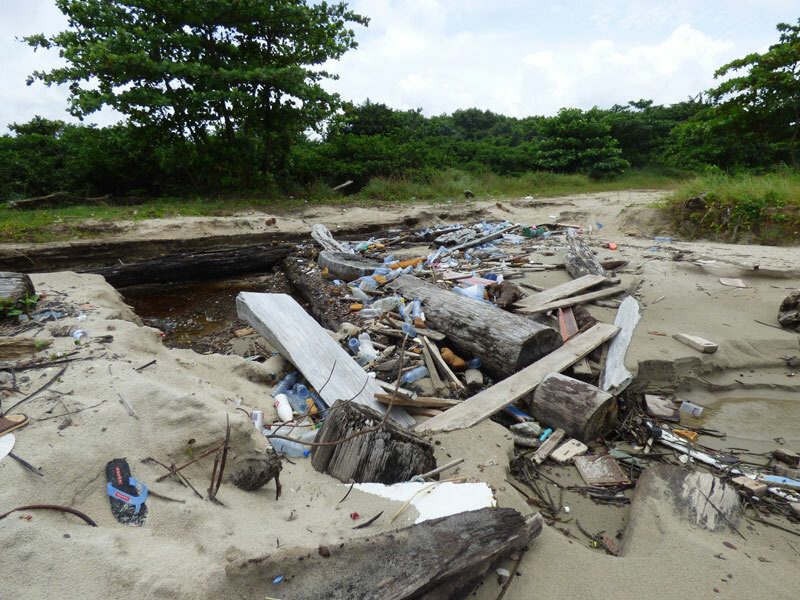 Within the city of Libreville, the plastic trash on many beaches is of extraordinary proportions (Figure 18), especially near the mouths of small streams. 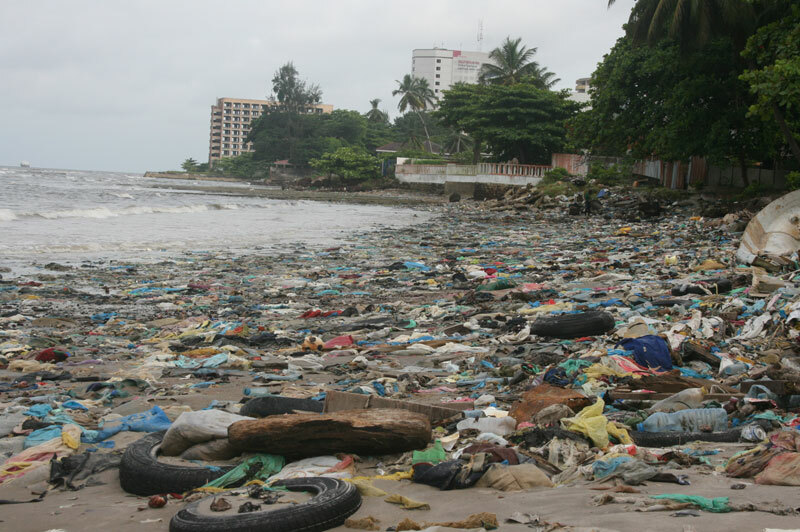 Clearly such massive amounts of plastic and other refuse on Libreville’s beaches not only destroy any beach tourism but must significantly add to the apparent pollution problem on the beach and in nearshore waters.